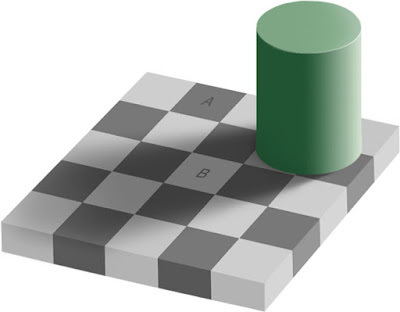 Just had to share - one of my favorite optical illusions: Are the colors in the A and B squares the same or different? Marilee took a look and said they're different. Chris happened to be here, so I decided a little Photoshop would settle the dispute. Drew a gray line from A to B then from B to A; Marilee still wasn't impressed. Or swayed. So are they the same or different?